Book Blast! Roping the Cowboy: 9 Romances on the Range – Win $25 Amazon Gift Card! 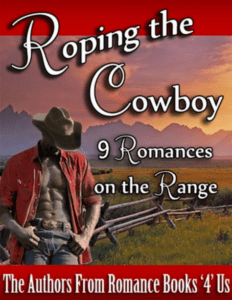 We invite you to Marianne Stephens for authors at Romance Books ‘4’ Us’ ROPING THE COWBOY: 9 ROMANCES ON THE RANGE Book Blast today at As the Pages Turn! Marianne and the authors will be giving away a $25 Amazon Gift Card! Leave a comment on each of their tour stops for extra entries! Sweet through sizzling collection of love stories includes contemporary, period, and historical romance, otherworldly romance, and romance with a touch of magic. mouth, but it also gave her entrance. Her tongue skimmed across his, and he was lost. against him, flattening her breasts against his chest. Desire spiraled through him. perched on his extended finger. “How did you do that?” whispered Linda. “No, I didn’t.” She smiled. It did a wolf whistle. Linda giggled. This sweet through sizzling collection of love stories includes contemporary, period, and historical romance, otherworldly romance, and romance with a touch of magic by Award-winning and Bestselling Authors: Janice Seagraves, Nicole Morgan, Rose Anderson, Denyse Bridger, Gemma Juliana, Michele Zurlo, Tina Donahue, Krista Ames, and Suz deMello. Marianne & crew are giving away a $25 Amazon Gift Card! This giveaway ends midnight January 27. Forward by retired NASA astronaut Jay Apt, PhD, veteran of four space shuttle missions. 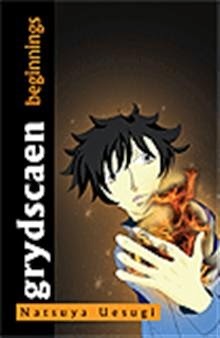 In Book Two, “Ascent,” Jeremy Kyner, now a teenaged boy, becomes the focus of his teacher’s animosity because of his infirmity. With the help of two dedicated school friends and an unconventional Jewish blacksmith, he takes to the sky, defeating his teacher’s plans to institutionalize him and forcing her to divulge her own, dark, secret. Book Three, “Emancipation,” opens as America is on the cusp of World War II. Jeremy Kyner, now a man, is barred from military service at a time when America is almost defenseless against marauding German submarines. Finally joining a group of volunteer civilian pilots that represents the country’s best hope to counter the Germans, Jeremy confronts a deadly enemy from an unexpected quarter and is offered a chance of achieving final emancipation. J. Knights is a retired FBI Special Agent. His assignments included violent crimes and fugitives, property crimes, civil rights investigations, and foreign counterintelligence. He was a surveillance pilot, SWAT sniper, media representative, and worked in the FBI’s technical investigations program. Knights also volunteered as a Civil Air Patrol pilot, squadron commander and public information officer. He is an emeritus member of the Imperial Public Relations Committee of Shriners International and Shriners Hospitals for Children. A native of New England, Knights resides in southwestern Pennsylvania with his wife and honeybees. He has authored several published articles on law enforcement recruiting. Benjamin’s Field is his first novel. Children Shouldn’t Play with Dead Things Book Blast! We’re thrilled to be hosting Martina McAtee’s CHILDREN SHOULDN’T PLAY WITH DEAD THINGS Book Blast today! But what if he was schizophrenic? He thought she wasn’t human. What was she supposed to do? Orient him to reality? Play along with his fantasy? She should have paid more attention. 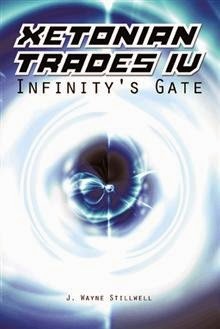 Xetonian Trades IV by J. Wayne Stillwell Book Blast – Win a $25 Amazon Gift Card! The Augerite invasion and the Reaper war convinced the United Galactic Treaty Organization (UGATO) leadership that the galaxy must be teeming with intelligent life that their descendants would eventually meet. Some would be hostile so they decided to use time travel for preemptive defense purposes. By knowing the future they might be able to take action in the present to enhance their security. UGATO had originally justified the time ship’s cost by promising to locate and visit God to discuss his real purpose, the meaning of life and the mysteries of the spiritual world. This was soon abandoned as fool hearty. UGATO traveled back in time 2,900 years to visit the Xetonian Messiah Graciana who convinced them that a precise understanding of God is not possible purely through the use of technology. God cannot be known in a physical sense and it would always require a measure of faith in order to achieve a state of grace. As the Unitarian survivors of the Big Bang and their alien allies continue their manifest destiny in the Milky Way Galaxy and beyond by traveling in time, their faith and courage would be tested. They were about to breech the zero time barrier or what the news media had dubbed ‘Infinities gate’. Pump Up Your Book and J. Wayne Stillwell are teaming up to give away a $25 Amazon Gift Card! Jessie Hunter is spoiled and always has been. He is in college when his father unexpectedly dies, and he must return home to sort out the family funds. Jessie expects to become lord of the manor, taking over his father’s business and land and becoming the high-powered man his father always wanted him to be. But nothing is as it appears to be. Jessie soon comes to suspect that his father was murdered and that whoever killed his father now wants Jessie dead as well. He can’t be sure why, but he knows he’s being hunted and must go on the run. Jessie must place his trust in an estranged uncle he never knew in order to stay alive. Now in hiding, Jessie leans on others to find safety and answers. But how will this spoiled, sheltered young man be able to solve the mystery of his father’s death? In order to get his life back, Jessie must be strong or end up dead at the hands of his father’s assassin. The story is about a young man named Jessie who is going home because of the death of his father. Jessie and his dad haven’t been that close the last few years of his father’s life and now he had to go home to find out the truth about his father’s death. He meets his uncle that he really never knew, only to find out that there was more to him than just the casual glance would reveal. 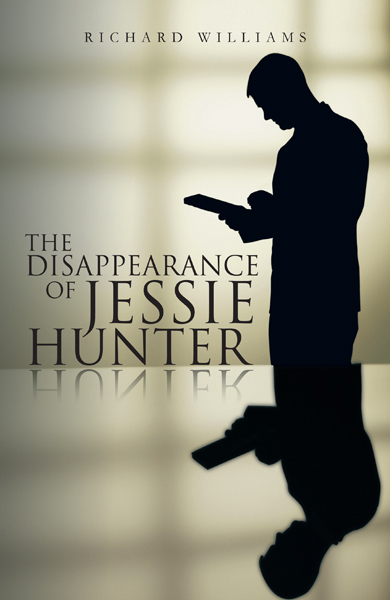 Jessie finds himself having to fake his own death and go into hiding. But what he learns during that time is what is going to help make him the man his father always wanted to be. Really no one is the inspiration behind the book as far as it being a real person. It was just a thought that came to me one day and I just kept running it through my mind until I came up with a story line that I liked. What cause are you most passionate about and why? That’s easy. My family is what I am the most passionate about. I have been blessed to have a loving wife for over forty years. We are blessed to have two wonderful kids and two very wonderful grandkids. I came from a broken home, so please believe me when I say that I am very passionate about family. They are my life and what keeps me grounded. Do you have any rituals you follow when you finish a piece of work? Yes, First I read over it, and then I put it down for a few weeks, take time to allow my mind to rest, and then I reread it again. Also, I take my wife out to the café’ for a latte. Who has influenced you throughout your writing career? The main person would have to be my wife. She has always believed in me and stood behind me. She has always been my strength and my love. Love is the most powerful inspiration you will ever find. First to see this book really be successful, and then to write the next book in this series. Richard Williams is also the author of the Guardians series. He and his wife, Janice, have two children and two grandchildren. They currently live in Mississippi with their two shelties. Baby to Senior Spiritual Life Years by Rev. Carol A Hale Book Blast – Win a $25 Amazon Gift Card! The spirit guides our life. It opens our life as a child and always stays with us. After each prayer our spirit will speak to your mind about God’s decision and we will hear about he best task for life. The spirit and prayers always gives us comfort relaxations to the mind. When the body has been or is in a accident, is sick, having surgery, financial problems, and life events. My life has had several perfect body safety and healings i was six or seven months old. The spirit with God guided my jobs and acceptance of my birth as a lesbian. Pump Up Your Book and Carol are teaming up to give away a $25 Amazon Gift Card!